Medicare Supplements present a great value for the Medicare patient as they are almost always accepted wherever Medicare is accepted across the country. This means you need not worry about network restrictions or referrals to see specialists. If your provider accepts Medicare then you know your supplement will work with that provider. This really comes in handy should you contract a disease or come down with a catastrophic event that requires acute treatment. For example, if you were to come down with cancer, you could typically use your Medicare and Supplement at nearly any facility or provider across the country with this insurance. This freedom alone presents an enormous amount of value and peace of mind. Medicare Advantage plans, on the other hand, are networked HMO or PPO’s requiring the patient to see in network providers. HMO plans have NO out of network benefits; PPO’s typically do allow for out of network benefits; however, the out of pocket expenses you would incur skyrockets. In fact, most Medicare PPOs leave you with as much as 10,000 dollars of out of pocket expense which could crush most seniors living on a fixed income. The plan F has always been the most popular plan option with Medicare patients primarily because it offers the most first dollar coverage of any of the standard plan options. As you can see from the above chart, the F plan covers the deductibles and co insurance left off by Medicare. This “first dollar” coverage means the policy holder has no copays, deductibles, or co insurance to pay to the provider. On the surface this sounds really great. However, this abundance of coverage comes at a hefty price. The F plan will cost you anywhere from 300 to as much as 600 dollars more per year than a G plan will. What’s more, unlike the G plan, the F plan is one of the only standard plans offered to guarantee issue right applicants. This means much higher average rate increases on insurance over time. Guaranteed Issue is a provision under Medicare that bars Medigap Insurance companies from underwriting policy holders based on either a voluntary or involuntary loss of insurance coverage deemed credible by Medicare. Say you live in New Mexico and have a Medicare advantage plan in that state and move closer to children living in Texas. If the advantage plan you had in New Mexico or Arizona is not offered in the state of Texas, then your insurance company will drop you upon your move to Texas. When this happens, Medicare requires all insurance companies to offer you a plan F without any underwriting (i.e. asking health questions on an application for insurance). This means one could have cancer, major heart problems, or emphysema, and could still obtain an insurance policy, but only plan F. Now if we follow this line of reasoning to its logical conclusion, what happens to rates if an insurance company takes on a lot of sick people requiring an unusually large amount of care? You got it! Rates naturally must go up because claims will, on average, be much higher. In my 17 years in the business as a licensed insurance agent I have witnessed plan F premiums go up, on average, 3 to 5% more per year than a G plan. So, 5% over four years means you could be spending 15 to 20% more for an F than a G over a 3 to 4 year period, which can become a great deal money over a relatively short period of time. 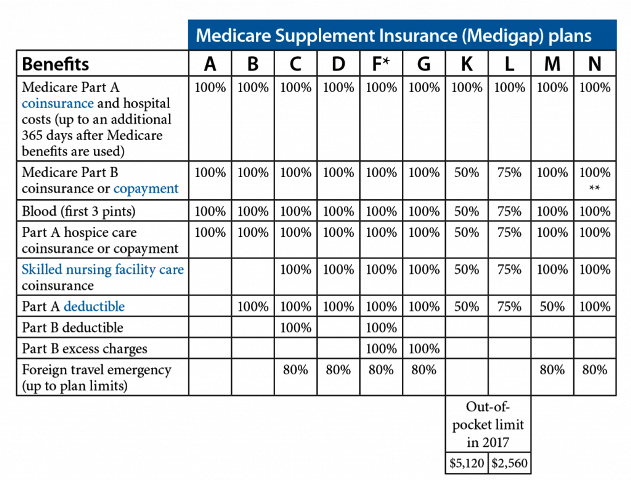 Supplement Plan G Explained As the above chart indicates, the only coverage difference between F and G deals with the Medicare Part B deductible. The plan F covers all deductibles and co insurance amounts left off by Medicare. The G plan covers everything the F covers accept for the Medicare Part B deductible. In 2018, this part B deductible is only 183.00 annually. This means regardless of how many times you see a provider or incur medical expenses, your deductible will not exceed this 183.00 for the calendar year. Remember the premium differential is anywhere from 300 to 600 dollars per year less with G over F. It does not take a rocket scientist to quickly determine the G as a better buy premium wise. increased premiums with this insurance is claims losses. premium structure over long periods of time. This is why our agency always recommends plan G over F. So what if you have to pay a 183.00 annual deductible. If your premiums are lower than the deductible and you do not incur such a large rate increase each year, it’ll put you in a much more sound position financially. Sure you can change your supplement each year if the rates go up, but what happens if you come down with a heart condition or have cancer? If this happens you could be stuck with the insurance company you currently have. What if this coverage happens to be a plan F and you became uninsurable later on in life? You guessed it! It would mean, on average, much larger rate increases than the G, leaving you with paying potentially thousands of dollars more over your lifetime than the G. I hope you learned something from this discussion and please do not hesitate to call our office for a more detailed description of the Medicare Supplement plans. One of our licensed and AHIP certified agents will be more than happy to review this insurance and offer up suggestions on how to improve without sacrificing valuable coverage. I H S Insurance Group LLC currently offers Medicare Supplement Insurance in Texas, Arizona, Louisiana, Tennessee, Arkansas, Missouri, Oklahoma, and New Mexico. We also have a renewal department led by Paula Moore who will shop your plans each year at your renewal. This is our pledge to you!